The Genentech Mahalo study is testing the progression of dry macular degeneration through the use of the Heidelberg SPECTRALIS® HRA+OCT, an advanced diagnostic and imaging tool. RCRI is one of a number of research centers worldwide participating in this study, entering the eighth patient worldwide. RCRI is using a novel proprietary medication from Genentech, whose aim is to reduce or reverse a particularly vision-threatening form of dry age-related macular degeneration called geographic atrophy. Several features of the Heidelberg Engineering SPECTRALIS HRA+OCT device are being used by RCRI researchers in this study, including its ability to measure fundus autofluorescence, a vital technique that can measure the extent of atrophy, as well as predict the likelihood of the speed of progression of the degenerative process. 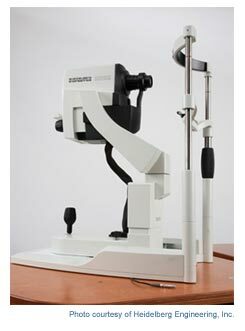 In addition, the system's imaging technology is significantly faster and produces detailed cross-sectional and 3-dimensional images of the eye. The result is greater image detail and clarity, and it provides the doctors with a more confident assessment of small changes in the eye.